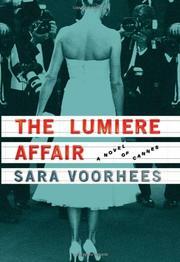 Film critic Voorhees’s fiction debut about a young American journalist searching for information about her dead mother while attending the Cannes Film Festival. Returning to France to cover the film festival, French-born Nattie has her own secret agenda. At age six, Nattie, her mother and her mother’s boyfriend Claudel were struck by lightning while picnicking near Cannes. Her mother died and Nattie was sent back to her American father, who hadn’t known she existed and who always refused to discuss her mother. Now Nattie wants to find out more. In Paris, she leaves a phone message for Claudel, who soon comes to see her in Cannes. He is barely 20 years her senior, handsome and sensitive—in movie terms, Louis Jordan to her Leslie Caron—and it’s quickly obvious where their relationship is heading despite a flirtatious Canadian journalist pursuing Nattie and the slightly creepy fact that Claudel was Nattie’s mother’s lover. Meanwhile, Nattie runs into the producer Jacques Vidanne, who directed Nattie’s mother in her one film role. According to Claudel, Vidanne was obsessed with her and made her funeral arrangements. Despite Vidanne’s efforts to evade her, Nattie soon learns the big secret: Nattie’s mother never actually died but was severely brain-damaged. Vidanne spirited her away from the hospital, married her and built a fortress on Corsica where Nattie finds her living like a beautiful child under his care. Having made peace with her past, Nattie is ready for her life with Claudel. The novel’s most fascinating character is the festival itself. Liberally scattering film references, some titillating, some obscure, Voorhees offers a lively insider’s view: the crowded pressroom, the gala parties, the rounds of actor interviews, the non-stop movies that range from awesome to awful. Movie lovers will enjoy Voorhees’s gentle satire of the business of film as high art. Unfortunately, the human drama that unfurls is less winning.